Kids can never seem to get enough of classic googly wiggle eyes! Hysterical massive giant wiggle eyes turn almost anything into a hilarious gag, crafting embellishments, Halloween Ghost Monster or Christmas Snowman decoration. These BIG googly eyes are just like their smaller counterparts, only enormously larger! Monsters, clowns and other crazy creatures come to life with this pair of large CREEPY Classic White with Black Pupils CONJOINED One-Piece wiggle eyes. Giant funny swirling Classic White with Black Pupils CONJOINED wiggle googly eyes. 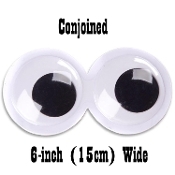 Classic round shape Conjoined Pair brings any inanimate object to life, for loads of creepy Halloween party fun or funny gag any time. High quality crafts decorations by Darice. Big Size 6-inch (15cm) Wide x 3-inch (7.5cm) Wide. ONE PAIR of Giant CONJOINED Plastic Googly Eyes.